fototazo has asked a group of 50 curators, gallery owners, blog writers, photographers, academics and others actively engaged in photography to pick two photographers that deserve (more) recognition - the underknown, the under-respected as well as not-appreciated-enough favorites. A little more information on the project is available in the first post in the series here. Today we continue the series with responses from Qiana Mestrich and Jason Landry. We began the series with responses from Nicholas Nixon, Matt Johnston, Blake Andrews, John Edwin Mason, Aline Smithson, Colin Pantall, Michael Werner, Liza Fetissova, Laurence Salzmann, Bryan Formhals, Richard Mosse, Shane Lavalette, Amy Stein, Amani Willett, Wayne Ford, S. Billie Mandle, Leslie K. Brown, Gordon Stettinius, Marc Feustel, Hin Chua, Adriana Rios Monsalve, Daniel Augschoell, Larissa Leclair, Elinor Carucci, Pieter Wisse, Daniel Echevarría and Natalie Minik. Respondent: Qiana Mestrich is a fine art photographer, freelance writer and blogger at Dodge & Burn: Diversity in Photography History. This Fall, Qiana will begin her graduate studies while enrolled in the ICP-Bard MFA in Advanced Photographic Studies program. She lives in Brooklyn, NY with her husband and son. Looking at her expansive photographs of icebergs and the arctic tundra, one would never guess that Camille Seaman didn't begin to pursue photography professionally until age 32. As part of her education, Seaman also wasn't afraid to approach her photography "heroes" to ask for their help in learning valuable skills of the trade. In this way she is an inspiration to those who might be afraid to ask for help and/or think they're "too old" to get started in photography. 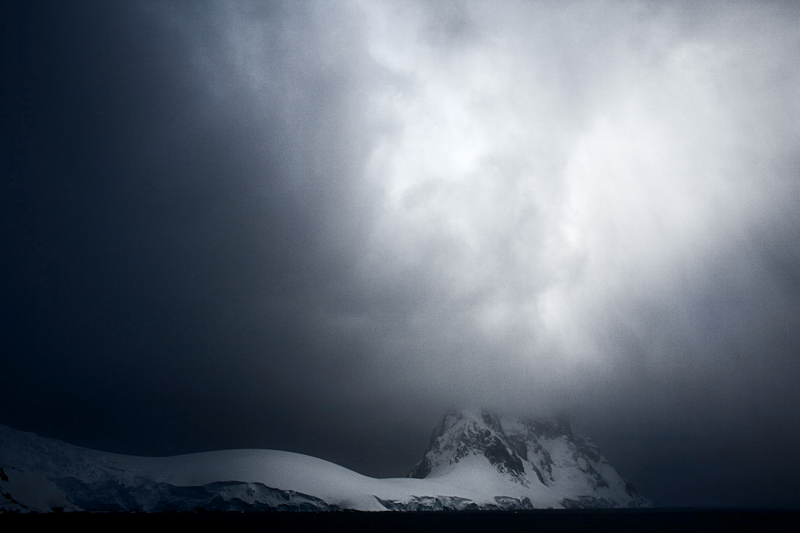 Read more about her amazing journey in Camille Seaman's Dodge & Burn interview. Fine art photography is seldom political, but that's the genius of Annu P. Matthew's work. Without being didactic, Matthew's series "An Indian from India" corrects and educates ignorant minds about the difference between Indians and Native Americans. 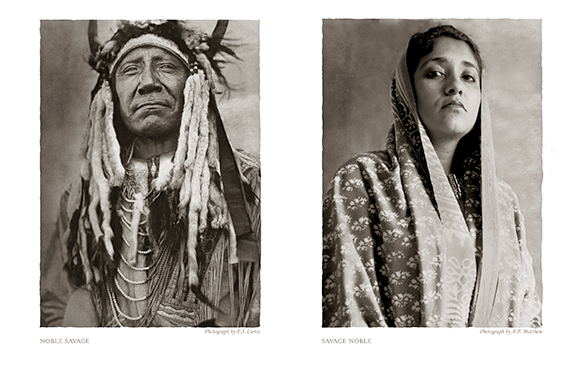 Blasting stereotypes Matthew creates diptychs that juxtapose 19th century ethnographic imagery with self portraits of her as the Indian from India. Cleverly tweaked captions, like "Savage Noble" vs. "Noble Savage," add another dimension of wit to her social commentary. For more traditional photography tastes, Matthew's "Memories of India" features images that I think would've made Henri Cartier-Bresson jealous. Respondent: Jason Landry is the Owner of Panopticon Gallery in Boston. Landry brings over 20 years of business management and fine art photography experience to the gallery. Landry received a MFA in Visual Arts from The Art Institute of Boston at Lesley University and a BFA in Photography from the Massachusetts College of Art and Design. Before acquiring Panopticon Gallery in 2010, he worked at the Photographic Resource Center at Boston University in various capacities including their Education Manager, Programs and Operations Manager and was a member of their Board of Directors. Landry and his wife are avid photography collectors and he currently serves on the Board of Directors for the Griffin Museum of Photography in Winchester, MA. 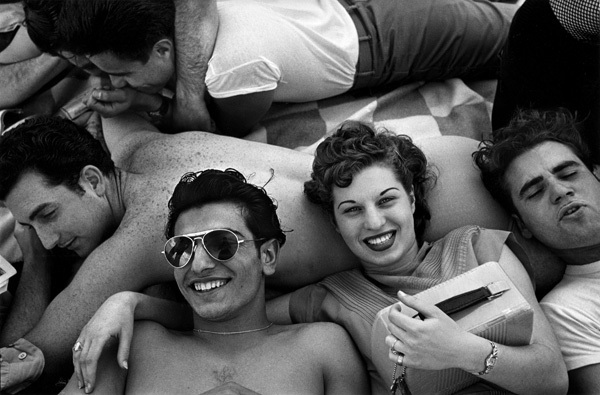 Harold Feinstein began his photographic career in 1946. By the age of 19, Edward Steichen had purchased his work for the permanent collection of the Museum of Modern Art and frequently exhibited it there. In the 1950's, Steichen was getting together work for "The Family of Man" exhibition. He invited Feinstein to be in it. At that time, Feinstein was very puritanical and told Steichen, "Look, a museum is a place where they should just show work because it is art, not because it fits in to a theme." And so Feinstein politely withheld his work from the exhibition. In his early career, Feinstein participated in the NY Photo League and is best known for his black and white documentary style, in particular, an extensive and often shown Coney Island portfolio. Feinstein states, "I often feel like I fell out of my mother's womb onto the beach on Coney Island with a Nathan's hot dog in my hand with the sounds of kids screaming on the cyclone. I just always loved that place as a kid way before I was doing photographs. It's loaded with people, and people are my favorite trees." Neal Rantoul's career as a fine art photographer and educator at Northeastern University has spanned over 36 years. He has had over 50 solo exhibitions and his photographs have been published in numerous trade periodicals. In 2006, Pond Press published his first monograph, American Series, which includes photographs from Pennsylvania, Utah, Washington State and Peddock's Island, off the coast of Boston, Massachusetts. Most people associate Rantoul as fitting into the genre of landscape photography, although there are many images he has worked on that would surprise you. 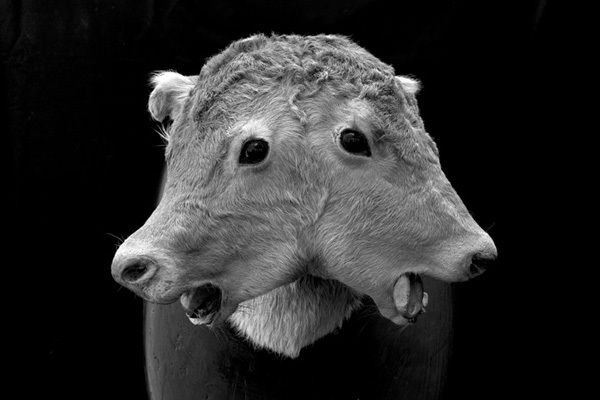 One of my personal favorites by Rantoul is this image, Two Headed Calf, taken at the Spallanzani Collection at the Civic Museum, Reggio Emilia, Italy.